There is one key question on the minds of Microsoft watchers: Who will be the company’s next chief executive? But, as it kicked off its first financial analyst meeting in two years, Microsoft had little to say beyond the fact that it continues the search process it outlined when it announced that Steve Ballmer planned to step down within the next 12 months. “There will be no update on this today,” CFO Amy Hood said at the outset of the company’s financial analyst meeting. The event, taking place in Bellevue, Wash., is closed to reporters but is being Webcast. Following Hood are COO Kevin Turner, followed by a panel of engineering leaders and then CEO Steve Ballmer. Finally, Hood is expected to detail changes to the company’s reporting segments. 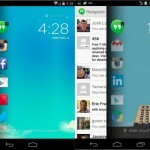 AllThingsD will have continuing coverage through the end of the meeting at 5 pm PT. “While this business faces some headwinds with the PC business … we have a full transition that is under way,” Turner said, beginning his talk. 1:16 pm: Turner breaks down Microsoft’s business these days. 55 percent enterprise, 19 percent computer makers, 6 percent small and mid-size business and consumer and online 20 percent. As for the company’s business units, the Office unit makes up 32 percent, Server and Tools 26 percent. Windows has fallen to third-largest, with 25 percent. Entertainment and Devices are 13 percent and Bing and online services are 4 percent. As for the transition to being a “devices and services” business, Turner says that doesn’t mean Microsoft is building all the devices. 1:20 pm: Turner says that when Microsoft first announced Surface, there was a lot of consternation among computer makers. But, he says doing the hardware allowed Microsoft to do better with Windows 8.1 update than if it only wrote the code. 1:22 pm: Outlook.com (former Hotmail business) is finally growing again. Skydrive: 250 million people using. The consumer businesses and their large scale will help Microsoft in enterprise, Turner said. 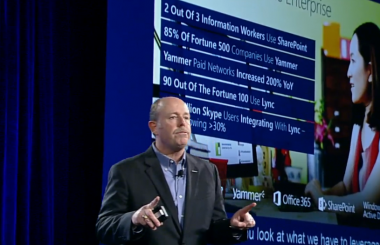 But traction on enterprise services, is “phenomenal” with Office 365 being its fastest growing product ever. Already on $1.5 billion annual run rate and due to “blow through that” this year, Turner said. Only multinational company offering public cloud services in China, Turner says. 1:32 pm: Turner yammering about Yammer and social opportunity. (It’s really big!) Plus Lync+Skype, Sharepoint. 1:34 pm: Skype growth has only accelerated since becoming part of Microsoft. 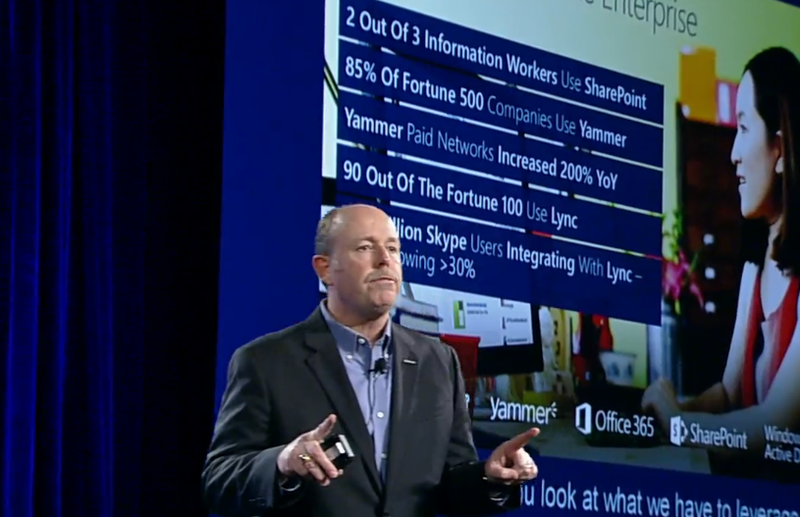 Plus, Microsoft can combine with its Lync unified communications for businesses. Turner excited about Xbox One launch, too. “We’re continuing to work through” how to be best in productivity across platforms. Microsoft also wants to be the leader in mobile device management. Its latest System Center software can manage iOS and Android devices, in addition to Windows phones and PCs. 1:39 pm: Windows 8.1 also brings new features for businesses, including remote device data removal. 1:42 pm: On phones, Turner notes Microsoft now in third, even if a distant third. Microsoft is doubling down — as clearly indicated by its plan to buy Nokia. 1:44 pm: As for holiday PC sales, he’s talking up Intel’s Haswell chips, which he says pave the way for fanless Windows PCs. “We’re working hard with our OEM partners across the board.” But, they have to improve the retail experience, too. Points to Microsoft’s work at Best Buy (200 stores so far). PC sales in those stores are up. Microsoft doing similar thing inside Dixon’s in the U.K. and looking at other options and major international retailers. 1:46 pm: On to Big Data. Which is Big. 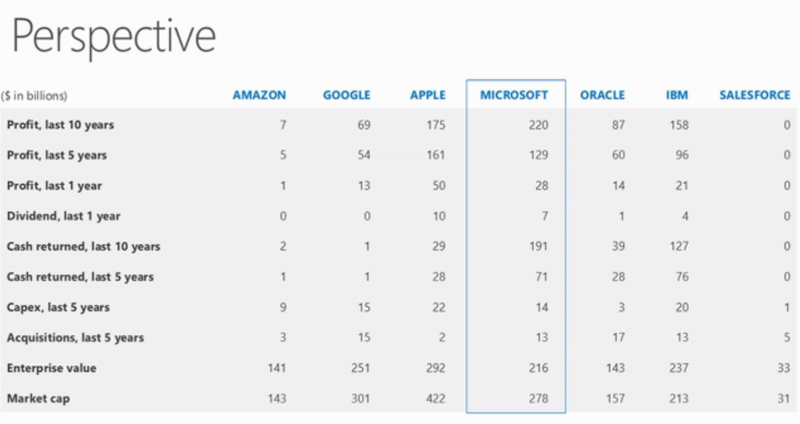 SQL is Microsoft’s biggest bet here. 1:50 pm: I’m now dialed in, but Turner is now down. Microsoft taking a 10-minute break to work on the Webcast, which is apparently down for Windows users as well. 2:01 pm: There was a power outage in the building, Microsoft says, with plans to resume the analyst meeting shortly. 2:12 pm: We’re told things are about to restart. Up next, once things resume, will be a panel of Microsoft’s top engineering leads to be moderated by Tami Reller. 2:17 pm: Reller starts by recapping July 11 “One Microsoft” reorganization. First question about Office on iOS and Android. How do you decide what to ship on what platform strategically? On iPad, for example, Microsoft has brought some apps, such as Lync, but not the full Office suite. 2:25 pm: Terry Myerson talking now about how Microsoft sees the similarities and differences among different devices. Core team under him working on all of those experiences, but will be tailored for different size screens and device categories. Reller: What about Windows RT? Myerson: ARM-based chips have incredible share in phones. Expect many more Windows tablets running ARM chips, Myerson says. 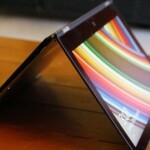 Speaking of Microsoft tablets, Reller notes Microsoft’s Surface event is coming up next week. 2:31 pm: Satya Nadella and others talking enterprise, competition vs. Oracle. etc. Myerson on Windows for enterprise: “We are continuing to see strength.” 75 percent of enterprise desktops are on Windows 7, Myerson says. Windows 8.1 adds some enterprise specific features that didn’t make the first Windows 8 release. Lots of talk about Microsoft’s Dynamics business, which despite its name is the really kind of boring software that midsize businesses need to run their operations. There are a bunch of different Dynamics products each named for the company Microsoft acquired. GP=Great Plains, NV=Navision, AX=Axapta. There, you already know more than you want to about Dynamics. 2:40 pm: Okay, so what about apps? 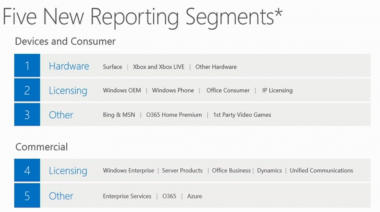 Windows Phone has 49 of the top 50 apps, Myerson says. Well, they don’t have Instagram, so presumably that’s the one. Windows 8.1 should help on the desktop Windows 8 side, he says. 2:50 pm: Asked when Microsoft can make the Dynamics business meaningfully profitable, Tatarinov says, “This business is meaningfully profitable,” and notes the broader power of the Microsoft software sold through resellers. 2:50 pm: Question on competitive alternatives to Office growing on iOS and Android. Analyst not buying that Office on those platforms is a first-class product. Tami Reller refers to Qi Lu’s earlier comments. “That will always be the lens” through which Microsoft evaluates how and when Microsoft brings its software to others’ mobile platforms. 3:08 pm: Now up, Microsoft CFO Amy Hood is back. Lots of talk about shareholder value, decisiveness, etc. 3:12 pm: Okay, here we go. On to business model transformation. People want to know where Microsoft is from a business model standpoint, if it is a “services and devices” company rather than a software company. Hood said the company has already been moving to this direction. 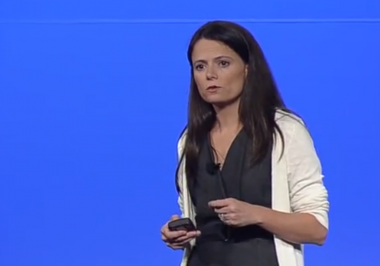 “We are on our journey,” Hood says, saying her goal is to point out some specifics of where Microsoft is. The opportunities are larger. More devices than there are PCs. Hood on how to think of the enterprise business. “Three Key Buckets” — now that’s serious old-school Microsoft. Key point: Subscription renewals should be higher than the 75 percent Microsoft currently gets on its enterprise agreements with big customers. There’s also an opportunity to sell more premium versions in a subscription world. “Opportunity, opportunity, opportunity,” Hood says. 3:29 pm: Hood is giving lots of examples, talking about how the opportunities in service business are larger. That is, of course, true. The question is will Microsoft’s market share stay similar in this transition and also if the additional revenue from services vs. software will make up for the added cost. It’s far more expensive to deliver a service than to ship software, which has huge gross margins. There will be, on the devices and consumer side, a hardware, licensing and other segment and, on the commercial side, a licensing and other. There’s a slide that explains what goes where. So, in hardware is Surface, Xbox and other hardware, consumer and devices licensing will include Windows, Windows Phone, consumer Office and intellectual property licensing. Other includes Bing and MSN, Office 365 home premium subscriptions and Microsoft-created video games. On commercial, licensing includes sales of Windows enterprise licenses, server products, business Office sales, the Dynamics and unified communications business. 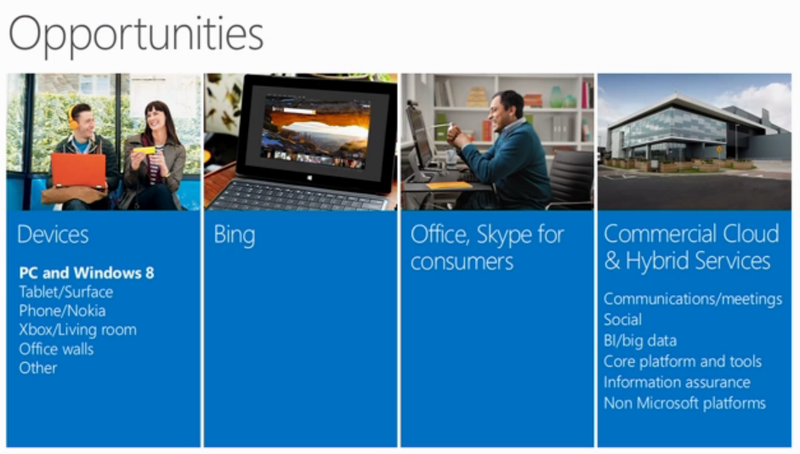 The other segment there will include enterprise services, Windows Azure and Office 365 for business. Why make a change this big? “In some ways, it’s hard,” Hood says, but it will enhance accountability. The company will report in both old and new way for the next quarter. With that, Hood turns the stage over to CEO Steve Ballmer. Ballmer: We built a heck of a good company. We’re a layup, but there are challenges ahead of us. We’re actually very well positioned. “There are headwinds in certain areas,” Ballmer says. 3:42 pm: Ballmer shows a chart comparing Microsoft to its rivals, saying Microsoft has made more money in the last 10 years than any of those companies and has a strong consumer and enterprise business. Even in the last year, Microsoft had more profit than any company other than Apple, Ballmer says. To compete going forward, Ballmer says, Microsoft needs to look to the consumer companies on the left of the chart and also to the enterprise-focused rivals on its right. It doesn’t mean Microsoft won’t try to innovate on the consumer side, and he says its important for being relevant even in enterprise, but the profit will “lead” from the enterprise side. But not a shrinking company. 3:48 pm: On the recent reorg — Ballmer says calling it a reorg almost understates what the company did. 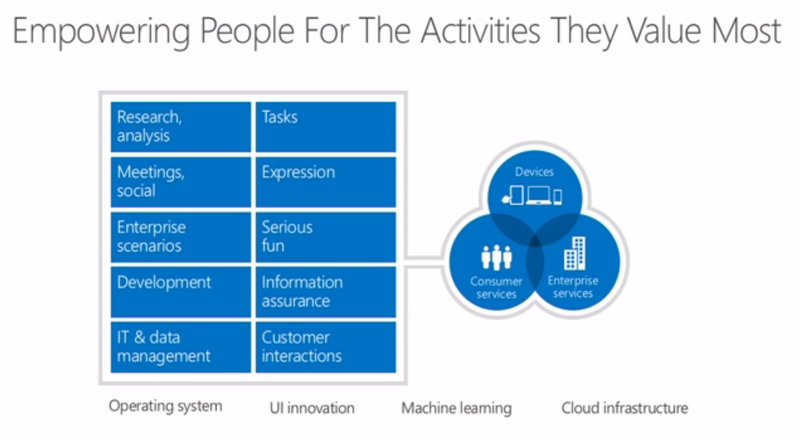 Ballmer is talking about focusing on “high-value” activities, where decisions are made, especially on consumer side. See the chart above. On consumer services, Ballmer says, outside of the phone companies there aren’t huge subscription businesses and on the ad side, only Google and perhaps Facebook have significant scale. 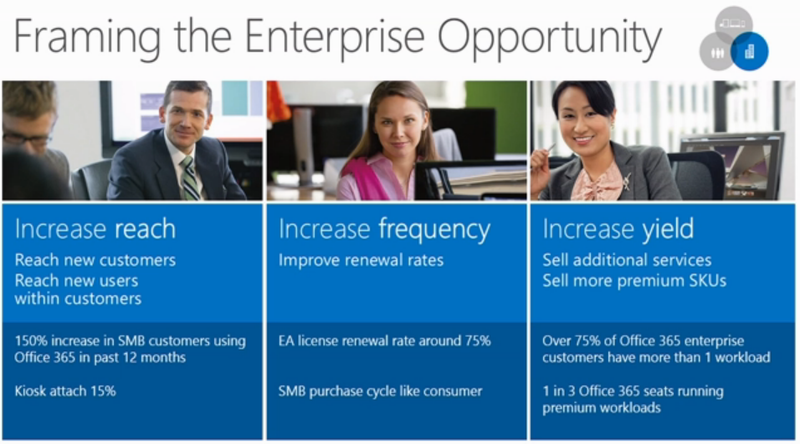 On the enterprise services side, Office 365 and Azure have to be a touchdown. “They just have to.” Ballmer notes that Microsoft is having great success there — and that it has been working on it for nine years, starting when it took over the enterprise operations at Energizer. On Windows PC, Ballmer says: We must do the job to make sure that the PC stays the device of choice when people are trying to be productive in life. That doesn’t mean people won’t user other devices. And Microsoft has to do services for some of those devices. On phones, Ballmer acknowledged that Microsoft still has virtually no market share, which he says presents lots of upside opportunity. Nokia deal is many things, but one of those things is making sure that Microsoft gets the benefit if it succeeds in phones. 4:01 pm: With “perfect awareness that there are headwinds in PCs,” Ballmer says lots of opportunities in the near term for devices business. On Bing, “we’re getting smarter.” A lot of customer acquisition deals didn’t pay off. 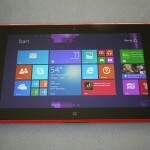 Now Windows devices are primary means for getting new customers. 4:07 pm: Ballmer on building for rival mobile platforms. “We’re building the things you would have us build,” he says, saying that religion plays less of a role than one thinks. 4:10 pm: Ballmer makes a subtle reference to Microsoft beyond him, saying it will be up to his successor to decide if there are businesses Microsoft should exit. 4:14 pm: Microsoft also has to look for next big thing and there aren’t that many of them. But whoever finds them will probably need skills in hardware and natural user interface skills. Cloud. etc. Naturally, he thinks Microsoft is well positioned. “There’s great economic upside,” Ballmer says. He’s of course still a big investor in the company. Ballmer says his fondest wish is to see the company so much more successful four or five years from now than it is today. Ballmer ends with an impassioned testimonial on his belief in the company. 4:29 pm: More non-talk about succession. Nothing to say. He won’t be the one to say it when there is, etc., etc. Hard to do real integration with Google Play and iOS rules, Ballmer says. 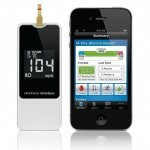 Our services will be available on a number of different devices. Consumers spend the most on devices and monthly phone service and not much beyond that, he says. Hence the need to be in device business. Ballmer on how does Microsoft get its services to be popular on non-Microsoft device? Skype is most popular consumer service. Try to add to it, but Apple and others have rules, too. 4:38 pm: Scale is important in Internet services, for example. Scale lets Google make more money on search and therefore have more money to pay for distributions. 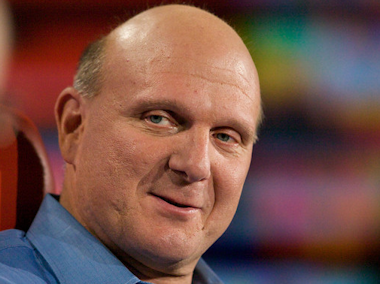 Ballmer says Google is rumored to pay Apple and Samsung $1 billion to $3 billion a year. Ballmer suggests more regulatory intervention needed. 4:41 pm: The best opportunity is on Microsoft’s own devices. While Ballmer says he is not confused about how low Microsoft’s share is in phones, its search share on Windows Phones is high. He said probably the best opportunity for Microsoft to gain search share is to gain device share. 4:46 pm: Ballmer reminds people he has dealt with commoditization before. Remember those Linux servers. Focus on things people will pay for — security, reliability. 4:50 pm: A little more reorg talk. Some units have reorganized, like the Windows reorg we wrote about last week. Others have yet to do the next layer of management changes. 4:53 pm: Ballmer’s big regret: The period in the early 2000s devoting a ton of resources to Longhorn and then what became Windows. Would have been better to put some of those people on non-PC devices. 4:54 pm: And with that, the meeting is done. The analysts are going to a reception next door to the meeting.